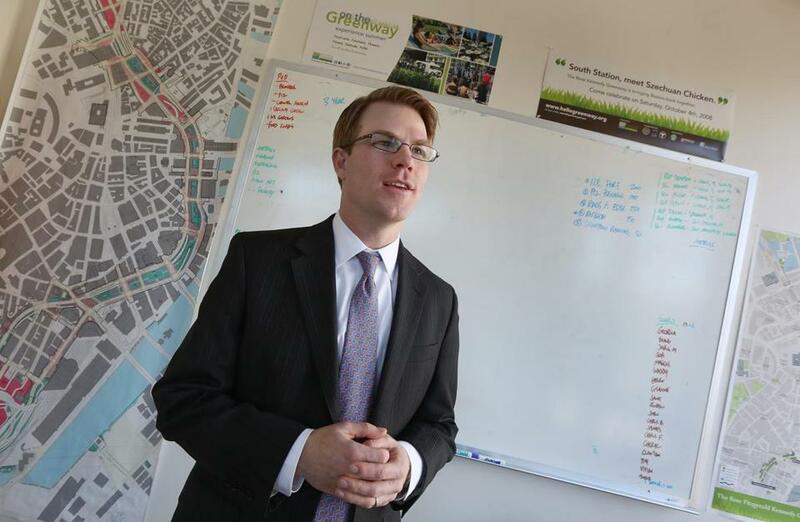 After serving as chief operating officer and interim director, Jesse Brackenbury last week was appointed executive director of the Rose Fitzgerald Kennedy Greenway Conservancy. Brackenbury, 38, was raised in New York City and developed an early appreciation for the importance of public parks in a crowded urban environment. The Greenway features seven fountains, food trucks, weekly events, and a new carousel for kids, but Brackenbury says he wants to add more attractions. One of his top priorities is public art. Brackenbury says the Greenway needs more consistent financial support from public and private sources to become a world-class park. One key for the Greenway is adding new winter activities. Brackenbury is considering the creation of a winter marketplace, an annual skating rink, or both. Brackenbury and others spent years exploring the creation of a Business Improvement District that would levy a fee on abutting property owners to help fund the Greenway. But he said the discussion is now heading in a different direction. The food truck business is growing rapidly on the Greenway, and Brackenbury says it has become a major source of income, with vendors now selling everything from asian rice bowls to sausages to vegan sandwiches. Development along the Greenway has begun to pick up. While new construction always raises concerns about traffic and shadows, Brackenbury says it can also help by adding retail and dining options.